Somerset House always has a lot going on, and I managed to tie in three things I wanted to see at the same time this week. Pick Me Up is their annual graphic arts fair which I’ve been going to for a few years now. Each year the curators choose artists for their Selects series which highlights up and coming artists from around the world. It being part fair as well as part gallery, everything is for sale. The prints are often in limited editions can cost anything from £5 to several thousand. In the Selects this year, I particularly liked Ugo Gattoni who’s book of Londoners cycling was came out last year and I’ve been meaning to pick up. I think that prints from this book formed some of the illustrations presented here. Hattie Stewart’s doodlings on magazine covers also catches the eye. William Goldsmith’s peeks into a forthcoming graphic novel intrigue, and I did fall a little in love with some of Ping Zhu’s characters. What you notice about Pick Me Up is that even if you go at a quiet time, it’s very busy. That’s because lots of students – by the looks of things, from A Level upwards – are on visits. The other thing you notice is that everybody has a camera or phone, and they’re documenting just about everything they see. Ordinarily this would be frowned upon, but here it’s practically encouraged. A heard a couple of artists explaining that this was an incredibly useful showcase of their work. So when they saw “suits” taking photos they know that commissioned work might come from it. In any case, even if you no intention of commissioning work, your camera acts as an aide memoire to let you look up artists and collectives that you’re interested in later. 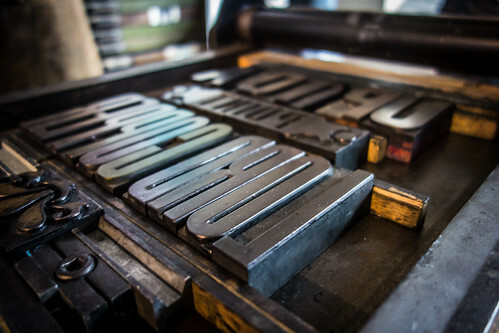 I chose a particular day to go along because I knew that A Two Pipe Problem who produce letterpress prints would be there and making bespoke prints. 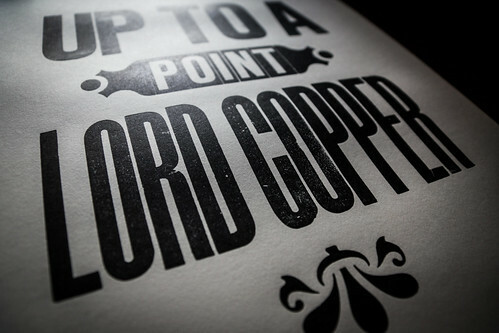 I’ve always found typography fascinating and had something in mind to print. So despite being very quickly booked up, I managed to get a space to have something printed. 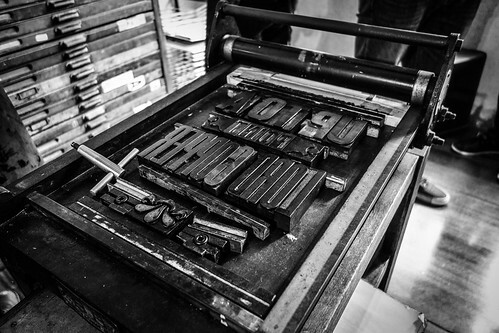 As well as a medium sized press, there were a selection of drawers, each containing one or more complete typefaces to choose from when putting together a print. Of course they also had some pre-printed posters available to buy. But nothing beats that personalised touch. The process is relatively straightforward. The letters are chosen and then carefully spaced and arranged to ensure an even spread. Obviously laying out the words is something of a skill, and I was completely happy to go with professional suggestions. Anyway, it’s a phrase which actually means no. And given that Scoop is set in the world of newspapers, having it printed in hot metal (actually, i think it was wooden lettering) seems very appropriate. And I got to pull the print myself! The only thing I feel marginally disappointed about is that previously there were inexpensive prints from the featured Select artists available to buy, but for the last couple of years these have been replaced with a pack of large postcards. While they’re nice, I preferred the prints. Mind you, it’s not as though there aren’t lots of things to buy. I was very tempted by some of the offerings from groups and collectives on display upstairs. Handsome Frank had a very tempting cycling shirt print by David Sparshott and some lovely pictures from Malika Favre, who was also a featured artist downstairs (I preferred the Khemistry set to the Karma Sutra one). The other two things I wanted to see were two excellent photography exhibitions – one just about to finish and the other having just opened. The Sony World Photography Awards had been announced the previous evening, and I was pleased that it wasn’t too busy wandering around the wide variety of photos on display. The overall winner was a series by Andrea Gjestvang, a Norwegian photographer who’s shot a wonderful series of photographs of some of the survivors of the appalling massacre of the young on the island of Utoeya outside Oslo in July 2011. Some of those featured have suffered debilitating injuries, and there was a sense of resilience in the photos. The photos are organised into a categories, and there really isn’t a duff selection in there. Indeed my only complaint was that we were sometimes only getting a very small selection of a larger collection that had been entered into the awards. William Eggleston was the featured photographer for a lifetime’s work. A room of his photos of America from the sixties and seventies was wonderful. I love his photograph of a redhead sat at the counter of diner (disappointingly not in the catalogue). A good selection of winning photos can be found at the In Focus section of The Atlantic website. But the pictures have featured widely in the press in recent days, including a good selection in middle of The Guardian (you need to see these pictures in a large scale). At the end of the exhibition, Sony, the sponsor, presents a number of the pictures on a 4K TV that must have been about 60″ in size. Seeing photos that way really is rather stunning. I’m not saying I prefer a screen to properly printed piece of paper. But for some images, it can really impress. Across the Somerset House courtyard, another exhibition was just coming to the end of its run. Landmark: the Fields of Photography is a rather spectacular collection of landscape photographs from a broad variety of photographers. Edward Burtynsky always attracts the eye with his industrial landscapes, or landscapes affected by industry. Mathieu Bernard-Raymond’s Monuments are very clever and wondefully executed, putting physical stock price charts into landscapes, while Simon Roberts’ We The English series is witty and clever. All the photos are available on The Positive View Foundation’s website. At this point, I had planned on crossing the river to see the Norman Parkinson photos on display in the National Theatre. I can never get enough of his photo “The Art of Travel.” But I had seen too much visual art for one day, so I left!